After their explosive debut into feature film making, Beast of No Nation, so many of their features have not quite lived up to that legacy. Many have a "made for TV" feel and despite its pedigree (Lunchbox director Ritsh Batra, the legendary Robert Redford and Jane Fonda, source novel by Kent Haruf) Our Souls at Night definitely falls into the TV movie mold. 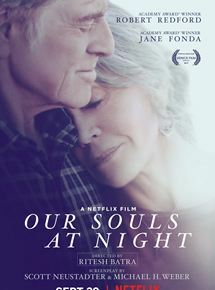 Redford and Fonda give quiet and unassuming performances as small town seniors who have survived their partners and connect in their golden years. There is truly nothing remarkable about how either tackle their roles. Their characters aren't expected to be anything but your very average small town folk. Fonda has a nice moment discussing the death of her child many years earlier but even that feels muted. Redford's character is even blander, never really given much to do but say "okay" to Fonda. Given even less is Bruce Dern is the most vanilla cameo you'll ever see. Batra appears to be taking a paint by numbers approach. He may be making a stylistic choice to plod through his fairly thin plot yet he, at the same time, chooses not to fill those ponderous moments with a sense of anything tangible. I get that the characters are seeking something less passionate than a typical romance but I never felt Our Souls at Night provided any feelings of true intimacy. When she finally puts her arm around him it feels inevitable and not revelatory. While perfectly pleasant to see these two great actors reunited Our Souls at Night just isn't that interesting. Filled with some cliched baby boomer assumptions about the world the film almost feels a bit pandering. It is all a bit anti-climactic for such a reunion.